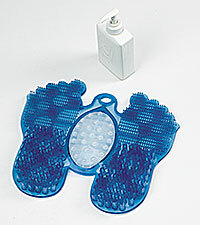 SCRUB YOUR FEET WITHOUT BENDING! This friendly foot on your shower floor eliminates bending to clean your feet. Even allows you to get to those hard to reach soles. Just step on its heel and swipe, rotate, and swirl your other foot over the nylon bristles for an invigorating foot scrub. The feet areas have two different types of massaging bristles. 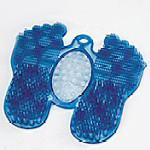 A separate massage pad with smooth, firm knobs lies in between the feet to give you a tactilely different massage. Your feet have never felt so good! Just think, you can enjoy a foot massage without effort every time you shower. A total of thirty (30) suction cups secured and arrayed to the back side of the massaging feet to give it a very secure grip on your shower floor. If you wish you can hang your "feet" through a hole on the top to dry or for storage. The massaging feet are blue with the clear, bump knobs in the center. The feet are 10.5 inches toe to heel and 11.5 inches side to side. Easy care and easy clean with the same products you would clean your bath mat. 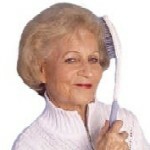 This Long Handled Brush is a necessity for anyone who has suffered a stroke, has Arthritis or any other condition that makes raising their hand above their shoulder difficult or impossible.